About a week ago, I did a post on this book. 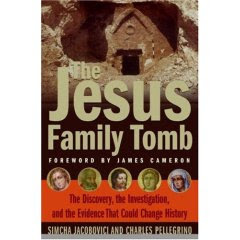 I saw the cover and mistakenly thought it was a picture of a documentary on the same "discovery" that "Lost Tomb of Jesus" covered. I was just flat wrong. Well, there is already a lot of information out there on this "discovery"--keep in mind it was made in March of 1980! This is not new information to anybody who has been doing research on first-century Judaism. In fact, since my dissertation involves historical Jesus research, I've done a lot of work in some of the pertinent areas here myself. I went on to indicate that a documentary on this had already ran, called, "The Tomb That Dare Not Speak Its Name". Actually, that was apparently the what a newspaper claimed this recent documentary would be named. The documentary that ran in 1996 on this "discovery" was actually called something else. I want to thank Mark for his kind correction. Mark is one of my favorite New Testament scholars out there these days--and his blog is at the top of my "favorites" list in my browser (and should be on yours as well). I'm quite humbled that he has graced these pages--and more than just a little embarrassed by the mistakes I made. I've deleted the inaccurate post--I really do not want to risk confusing anybody else on this. For some other great Goodacre debunking, check out his important book, The Case Against Q: Studies in Markan Priority and the Synoptic Problem. Harrisburg: Trinity Press International, 2003. 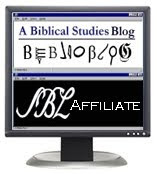 John 21: Later Addition or Epilogue?